In this page two point form question7 we are going to see some practice questions in the form of quiz.We have several ways to find the equation.We have shown four ways.A linear equation or an equation of the first degree in x and y represents a straight line.The equation of a straight line is satisfied by the co-ordinates of every point lying on the straight line and not by any other point outside the straight line. Here (x1,y1) and (x2,y2) are the points on the line. If we have any two points on the line we can use this formula to find the equation. Find the equation of the line which is passing through the points (1,4) and (3,-2). Find the equation of the line which is passing through the points (0,4) and (3,1). 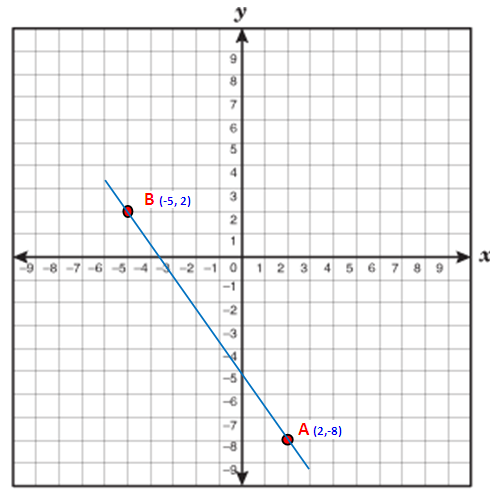 Find the equation of the line which is passing through the points (3,1) and (-3,2). Find the equation of the line which is passing through the points (2,6) and (1,2). Find the equation of the line which is passing through the points (5,-5) and (2,7). Find the equation of the line which is passing through the points (1,3) and (0,7). Find the equation of the line which is passing through the points (2,-8) and (-5,2). Find the equation of the line which is passing through the points (3,0) and (4,-1). Find the equation of the line which is passing through the points (-1,-5) and (-3,-1). Find the equation of the line which is passing through the points (0,-5) and (4,-6). Find the equation of the line which is passing through the points (4,-3) and (0,-2).